This branch of UNISON is running a campaign to raise awareness of the benefits of taking a proper break at lunch time. Taking a break has been shown to improve wellbeing and mental health as well as increasing productivity – a win-win for everyone! 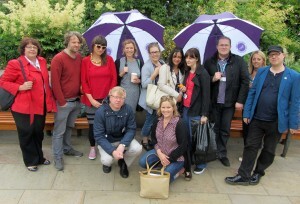 As a start to the campaign we organised a picnic lunch in the Peace Gardens on Wednesday 8th July. Several members attended the lunch where there was fruit available, a raffle and the chance to catch up with colleagues. We also had two new members sign up on the day. The main raffle prize of a pedometer was won by Lucy Davies, Sue Lund and Sarah Bond won t-shirts, Lucinda Wakefield and Barbara Mainland won vouchers for SHU Active. Hallam Active has generously donated more free class vouchers and if you were unable to attend the lunch and would like to make use of the vouchers, please contact Tracey Holland who will arrange to send you a voucher. If you give the gym a try, let us know how you get on! We are planning further follow up activities – if you have any suggestions just let us know! This entry was posted in Front Page, Membership benefits by Admin. Bookmark the permalink.